I don’t have much knitting to show for this week. 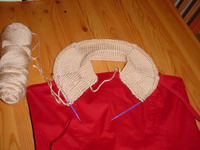 I started a project on Monday and knit on it Monday night and Tuesday night. By the end of Tuesday night I realized I had lost my mind in the amount of stitches I had added to my cast-on row and ripped it out. I started it over last night. It’s the mini-sweater over at glampyre (check out her new pattern, too, very cool). The dress underneath it is just a simple strapless dress. It has halter straps but I’m not going to wear those. So, I thought the mini-sweater would be the perfect thing to keep me from freezing my tail off at the wedding we’re going to this weekend. I’ve got a ways to go but I have two more nights and a four hour drive to knit. I think I’ll be okay. On a totally unrelated note, does anyone else have a particular word they use that drives them crazy but they can’t stop using it? Mine is "so". I think I managed to just use it once in this post, but I typed it in and corrected it many more times than that. Helping my knitting along, some fluff. My guilty tv pleasure of America’s Next Top Model and a new fluffy snack. Jen, over at the Big Lug, suggested that I try frozen cool whip on graham crackers. I love cool whip, but hadn’t tried it frozen. I highly recommend this variation on an ice cream sandwich of sorts. You’re going to finish your sweater on the way to the wedding? Hopefully it will be done before that, but I know the feeling. Actually. I use actually constantly and actually I think it makes me sound like a dork.